This collection considers music within the spheres of production and consumption and pulls together an interdisciplinary collection of music studies from around the world, ranging from an ethnomusicological analysis of the condition of Tibetan music and its role within the Chinese state, the changing reception of anti-apartheid music by white musicians in South Africa according to new configurations of society and its memory of recent history, a lyrical exploration of jazz as a signifier of crime and other nefarious activities within film history, an analysis of how music charts and maps the social network and gender roles in Jamaica and a landmark commentary on how music is framed by David Hemsondalgh. 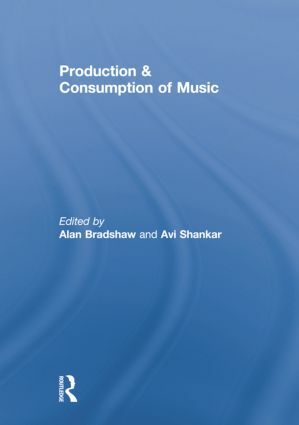 As opposed to other studies which explore music just in terms of its reception or its composition and distribution, this collection should make necessary reading for anybody interested in the wider nexus of music’s existence and how it waxes and wanes with ideology, politics, gender, business and much more besides. 1. Introduction. Alan Bradshaw and Avi Shankar. Dr. Alan Bradshaw is a Senior Lecturer in Marketing at Royal Holloway, University of London. Dr. Avi Shankar is a Senior Lecturer in Marketing and Consumer Research at the University of Bath. Previously, they were both comrades at the University of Exeter from where this collection was hatched.